Best aromatic perfumes are good choice for to present as wedding gift for the newly married couples on the day of their wedding. As every ones knows that the wedding presents take important part while attending a marriage ceremony and related functions. It is a tradition for the guests to present a useful product as gift for the newly married couple. The price of the gift is not important but the wedding present must be useful for the newly married couple, so they will always remember the gift and the presenter. If you are going to select good quality perfume with good scents as a wedding gift it is a good idea to do so. Perfumes are produced for men and women in different size, bottles or in small jars. Men's perfumes used to have little stronger in fragrance than the one made for women. Most perfumes used to come in darker shaded bottles in the form of spray to concentrated one. Top branded perfumes not only come in specially designed bottles but also they have good beautiful packing and carry bags. When you are visiting the perfumery tell the sales person what you are looking for. When you say that you are looking for a good pair of perfumes for to present as wedding gift at the wedding the sales person can assist you with the brand and price and will provide a good warping with a hand written presentation card. Be little cautious as the branded or endorsed perfumes by the top cinema stars or sport personalities can be little expensive than the other perfumes. The perfumes can be classified for their origin as made from plant, animal, synthetic and other natural sources. Tamil people used to use flowers, aththar (Attar), javvadhu and punugu from the ancient times to make good perfumes with scents. As a gift pack you can buy complete range of perfumery for her and for him at any store. Or can buy expensive identical men and women perfume bottles which will look large for men and small for women from any of the top brands. 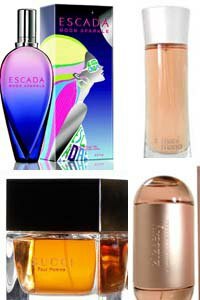 Concentrated fragrance perfumes used to come in small bottles but are expensive when comparing it with the normal perfumes. They are used to apply on the body or on dresses by a pin point and their fragrance can travel long distance and can stay in the body for days. So buy and present perfumes with nice fragrance when presenting them as wedding gift at your loved ones wedding ceremony or party for them to remember you always.